Electricity is a system and resource in Space Engineers that is used to power most devices. It is created using a large or small reactor, or by using a Solar Panel. It can be stored in a Battery and discharged to the grid it is built on. Any device that has a direct block connection to a power source will be powered by that power source; that is, if a reactor is on a ship, all devices attached to that ship should receive power granted there is enough power to supply to the load. Electricity can pass through rotor blocks, pistons, and locked connectors (incl. small-to-large connections), but not landing gears. Most blocks have off switches if you want to save electricity temporarily, which is particularly useful in Survival Mode. 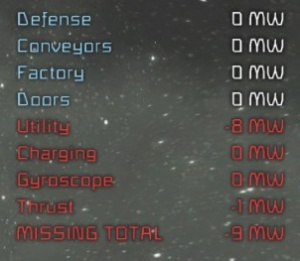 In Space Engineers the rate of energy transfer and energy conversion is expressed in watt (W). The unit watt comes commonly prefixed to kW or MW, as seen in the table. An amount of stored electricity is expressed in watt hours (Wh), which can be thought of as the product of a rate of energy transfer and a time this rate was sustained. If, for example, you need 500 W for 5 hours, a battery storing electricity to the amount of 500W*5h = 2500 Wh = 2.5 kWh will suffice. Typically you will encounter Wh, kWh, and MWh units in the game referring to stored energy in a charged battery or in fuel like uranium ingots. Conversely, W, kW, and MW units describe a rate consumers (e.g. refineries) and producers (e.g. reactors) of electricity work at. Reactors are the main source of reliable electricity, and they require Uranium ingots as fuel. 1 kg of uranium ingots will be exploited for 10 MWh of power. That is the equivalent of a reactor being drawn on to supply 10 MW for 1 hour. Or, 20 MW for half an hour, and so on. A large block Small Reactor generating electricity at its maximum rate of 15 MW to supply a large ship's total electrical needs (such as refineries, thrusters at full capacity, etc), will consume 1 kg of uranium in 4 minutes, while a large block Large Reactor will consume 1 kg of uranium ingots in as little as 12 seconds at its full output of 300 MW. Consumption of Uranium is solely decided by your current energy demand. There is no difference in efficiency between large and small reactors per uranium ingot, so a large reactor doesn't use uranium or extract any more energy out of uranium ingots than any small one would. It also makes no difference how many reactors you have online, reactors that are not needed will not draw any unnecessary power or use any uranium within them until required. A Battery is special in that it doesn't generate electricity, it merely stores it for later use. It's wise to combine renewable electrical generation from solar panels with batteries and not reactors since a battery charging from the latter is only 80% efficient. This efficiency penalty means that a battery needs 20% more power (Wh) for the energy it will store and return. That is while it will return 3 MWh (for large batteries) charging at a maximum rate of 12 MW, the battery will require 3.6 MWh for a full charge, thus 600 kWh will be wasted. A Large Ship battery continuously drawn on at its maximum output rate of 12 MW, beginning at full charge of 3 MWh, will deplete in 15 minutes. In the event of power failure or a power deficit, the grid will also prioritize what receives power. In Space Engineers, electricity sources are ranked in order of which of them will be used first to fulfill electrical demand as a sort of automatic intelligent power management sub-system. The purpose of this is to utilise power sources intelligently, for example if there is both a Solar Panel and a Large Reactor available to use. Instead of equally distributing a load across them the grid will attempt to utilise all of the output of a solar panel, before using the reactor and use the reactor to make up any difference in demand that the solar panel cannot provide. Thereby saving Uranium, instead of needlessly letting solar power go to waste. In addition to this the electrical system will also prioritize certain sub-systems over others in the event of a power deficit, that is, insufficient output available to meet demand. Most of the lower ranked ones such as Batteries, Thrust and Charging are adaptable meaning they automatically handle reduced input but function with lesser effect for thrusters this means they still provide thrust but not as much as they could at full power, while batteries simply take longer to recharge. Certain systems are not adaptable meaning they either receive power or don't resulting in blocks shutting off. Charging - Jump drive, specifically players inside cockpits or passenger chairs, recharging their suits. Batteries - Any Batteries attempting to charge themselves. (*) Solar Panels have a maximum output depending on their angle to the sun and the amount of actually lit surface. Given values are the maximum achievable output with perfect conditions, therefore efficiency and output may vary. Comparing them directly, the small reactor provides far more energy for the space it takes up; for example, 20 Small Reactors is equal to the output of a Large Reactor with only two-thirds of the space used. Despite this the large reactor offers greater economies of scale, requires less Conveyor complexity and in general is more useful in a variety of important applications especially as Powerplants for Large Ships, being both lighter and requiring fewer resources to construct. This makes Large Reactors ideal for ships that can take advantage of their reduced mass and accelerate or decelerate more easily, and therefore use less Uranium Ingots. Small Reactors are therefore ideal for stations that do not need to move, situations where physical space is precious or presents relatively light power needs that would not require a larger more expensive reactor. For example, a large reactor only needs 40 Metal Grids while a small reactor needs 4 Metal Grids at approximately 10 Small Reactors (150 MW) you would start to see economy of scale benefits clearly when using the large reactor. Between them however, they use Uranium Ingots equally as efficiently neither one will manage to extract more energy than they would otherwise have to. For power information relating to thrusters, see Thruster Mechanics. (**) The maximum power usage of laser antenna include both beaming and rotating at once. Beaming alone would be 180 for Small and 576 For large. (***) The power cost of Gravity Generator is directly proportional to the field size and acceleration (absolute value, so 1 g consumes the same as -1 g). (****) Only when charging it's internal battery. This page was last modified on 14 February 2019, at 15:39.